With the upcoming All-Star game, I have begun thinking about one of the original reasons that I wanted to start a site like pFoody. When I was doing more travel, I always wanted to know what places locals recommended. A web site seems to be a pretty effective place to share information like that. 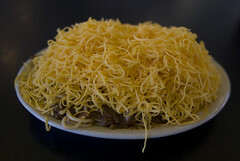 So I am going to offer two posts that highlight some of my favorite places to eat in Cincinnati. Now, I am a Cincinnati native, so I know my Cincinnati locations, but this is just one guy’s opinion, so I prefer to think of it as the non-definitive guide. But if you are visiting, this will give you a primer on our Chili, a classic ribs place, some ice cream, a local pizza joint, and steak. This post will focus on Cincinnati Classics. This means places that have a long history in Cincinnati, and provide something that is distinctly Cincinnati. 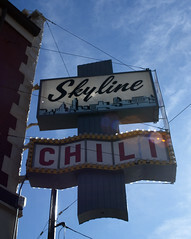 If you are wanting to get a taste of Cincinnati, this is a good place to start.